With the lack of snow now is a good time to start thinking about the Spring. Most likely you are prepared for any snow or ice events that may arise. Now is a great time to schedule repairs and upgrades for your equipment that you will be taking out of storage for the warmer months. It is also a good time to schedule a date for having your plows and spreaders prepared for storage. Plows need some special care for off season storage. If they are not prepared, unnecessary and costly damage can occur while they sit. Plows are built strong, and are mostly steel. Rust can wreak havoc on a plow. Mainly on the hydraulic system components. While it is not pretty on the moldboard and framework, it is usually not detrimental to the plow or its functioning properly. Storing your plow properly in the off season is very important. There are some "do's" and "don'ts". Always wash your plow thoroughly to remove salt and grit accumulations. Never store your plow under a tarp. It accelerates the rusting process faster than you can imagine. Storing your plow under a tarp on bare ground or grass is even worse. 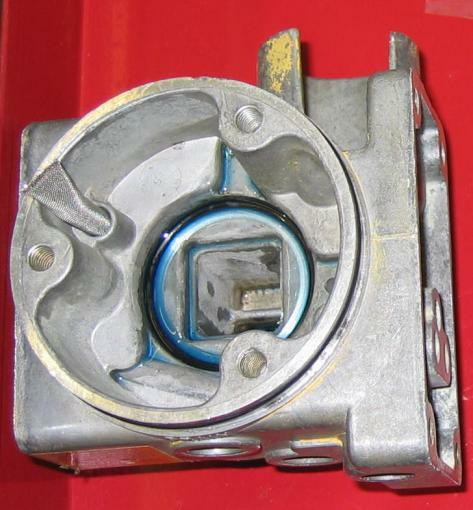 Always have your hydraulic system flushed, including the angle rams prior to storage. Moisture in the hydraulic system will cause rust on the steel parts. This always leads to problems in the fall that can be avoided. Always protect your exposed rams on the angle cylinders with Fluid Film or grease. Rust will quickly turn into pits that will chew up the seals and allow fluid to leak out, and moisture to get sucked in. Any light rust can be polished off now, and protected with Fluid Film or grease. Always fully extend the lift ram on the pump, and coat it with Fluid Film or grease. Have your plow inspected for stress cracks or signs of structural failure. This allows plenty of time for repairs before you need it again. Inspect all welds and framework for signs of stress and damage. Inspect all pivot points and moving parts for wear and damage. Check all wiring on plow side for signs of chaffing or damage. A proper fluid change and filter cleaning / replacement on the plow pump assembly. This involves some dismantling of most units. You can't get all the gunk out by just draining it and adding new fluid. Inspection of plow pump for damage. *This is all based on the plow working properly when it is dropped off for service. All of the above does not include any parts found to be damaged, that need to be replaced for proper operation. The picture above is a Meyer E-47 base ready for assembly. The lift cylinder O ring is oiled and in place, and the sump filter is installed (to the left of the O ring). 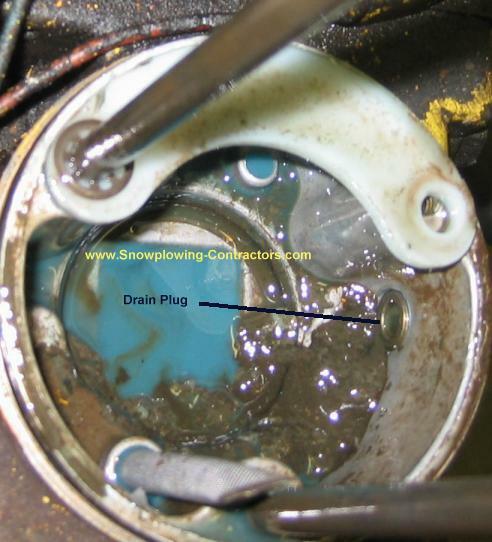 Look at how much space there is for debris to accumulate below the level of the drain plug (bottom of picture). Now scroll down! The above picture shows just how much gunk can accumulate in the sump base. This one was so bad the drain plug was partially blocked, and needed to have the blockage removed just to drain the pump. We were not surprised to see this on the inside. You can also see how milky the fluid is. It should be a translucent blue, like in the photo above this one. There is a lot of water in this hydraulic system that needs to be removed.